Collins Booksellers - 1606 Actual Triggers to Set the Right Goals, Develop Powerful Focus, Stick to the Process, and Achieve Success by Nicholas Mag, 9780463657416. Buy this book online. The Miracle! 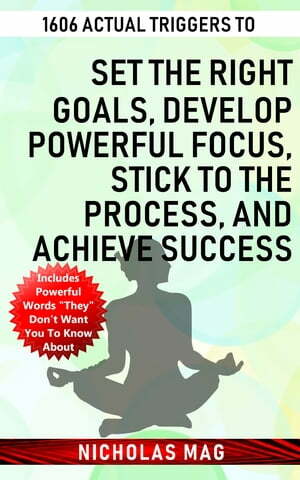 In this book Nicholas presents you a practical, very simple, detailed method of how to Set the Right Goals, Develop Powerful Focus, Stick to the Process, and Achieve Success. You will feel the effects immediately and the results will appear very quickly! So it was in my case. The order of words is extremely important for every book written by Nicholas. These are arranged to be traversed in a certain way so as to eliminate certain blockages in the human being, blockages that are bringing disease or failure on various plans. You don't need a big chunk of your time or expensive programs. Everything is extremely simple! This book helps you step by step, in a natural way, in just 3 minutes a day, to change your misguided way of thinking and to Set the Right Goals, Develop Powerful Focus, Stick to the Process, and Achieve Success.